The first edition of the guidebook to everybody's new favourite Spanish climbing destination sold out in just 18 months and so Roca Verde gets a makeover. Totally revised and updated, this new version comes jam-packed with even more crags and routes across the regions of Asturias, Cantabria and Leon in north-west Spain. Working with many of the most active groups and equippers from each area we have added 6 crags never before published, as well as new sectors at existing crags and a couple of classic crags missed from the first edition. Roca Verde now has over 50 crags with 239 sectors to go at; and with over 500 additional routes there is a staggering total of nearly 3500 routes packed into this edition. Every topo has been overhauled and updated with new colours for each grade of route: making an 'at a glance' assessment of each sector for your grade much easier. In addition there are even more superb photos, from some of the regions' best photographers, featuring some of the best routes and climbers in the area capturing the spirit of each crag. 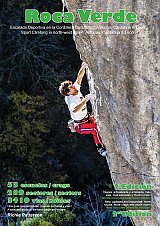 In this new edition there is also an exclusive overview of the bouldering in Asturias; giving you directions and downloads of topos for some of the best spots. Finally, (and maybe a first in climbing guidebooks), there are QR codes scattered throughout the book linking to videos of various routes and boulder problems across the regions. In this way you can get an even stronger flavour of the venues and get some 'sweaty-palm' psyche even before you arrive. So with over 50 crags, 239 sectors and nearly 3500 routes; an overview of the bouldering; links to videos and over 200 full colour action photos this is the definitive guide to the Roca Verde region.